You wouldn’t know it from this heat, but fall is almost here! Fall is my favorite time of year. And to be honest, (unpopular opinion coming…) I’m not a fan of the pumpkin stuff. I don’t drink the PSLs, I don’t eat pumpkin pie, I just really don’t care for pumpkin anything. But Shipyard Pumpkinhead is a super popular fall beer here in Boston. 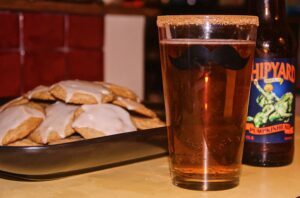 And it’s served in a glass with a cinnamon sugar rim. Not only am I not a pumpkin fan, but I’m also not a beer drinker. However, I tried this beer with the rim, and loved it! I drank the whole thing! I mean, given, there is sugar on the rim, and I don’t pass up sugar. But still, I drank a pumpkin beer! My first thought when writing a recipe with Pumpkinhead was to use this in a snickerdoodle type cookie because cinnamon sugar, obvi. But when I tried that recipe out, there just wasn’t enough of the Pumkpinhead flavor coming through. The recipe is still amazing, though, and I’ll include that recipe in the notes of the recipe below. 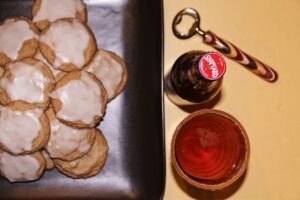 So to get more of the Pumpkinhead flavor, I iced the cookies instead and they turned out fabulously! 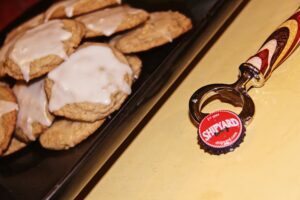 Bring these cookies (and the rest of the Shipyard) to your next tailgate! Maybe if we eat enough of these, the fall weather will follow! Preheat oven to 325 F and line baking sheet with nonstick foil. Add in egg, yolk, and beer, and beat. Mix in baking soda, cream of tartar, salt, and cinnamon. 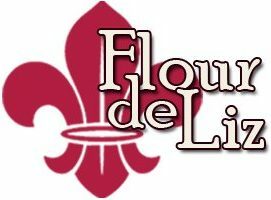 Add in flour and mix till combined. Form balls of dough (I used a cookie scoop) and place balls about one inch apart on lind baking sheet. Combine ingredients till they form a thick glaze. Add more powdered sugar to thicken, or more beer to thin. 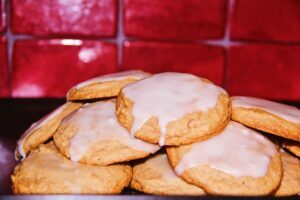 Once cookies have cooled completely, drizzle or spread icing over the top of each cookie and let dry. If cookies are not fully cooled, the warm cookies will absorb the icing. 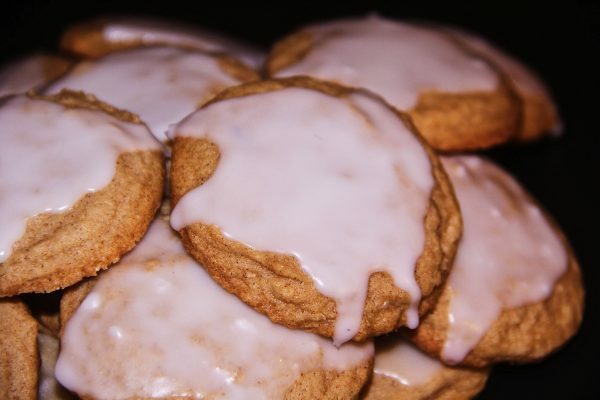 If you would prefer the snickerdoodle version to the iced version, in place of the glaze, roll the balls of cookie dough in a mixture of 1/4 cup sugar and 1 tablespoon cinnamon before placing on baking sheet.